Mauna Kea is one of the most important land-based astronomy sites in the world. Mauna Kea nicknamed the white mountain, is a dormant volcano on the island of Hawaii it is known for number of independent astronomical research facilities located on the summit. Its one of the six volcanoes forming the island, and is about 190 miles from the capital Honolulu in Oahu islands. 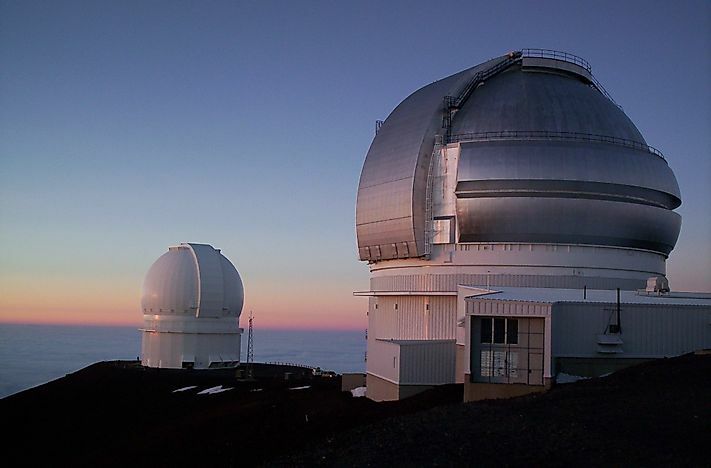 According to the University of Hawaii (UH) Institute of Astronomy, at the summit Mauna Kea is a broad volcanic landscape, comprising of cinder cones on a lava plateau, and clay rich soils. The atmosphere above the mountain is dry and cloud free, but summer months bring snow, strong winds, storms, thick fog and hail. Mauna Kea is associated with astronomical observatory, tourists numbers are growing steadily. As of 2015, an estimated 300,000 people visited, compared to 200,000 in 2010. There are flights by Hawaiian and Go airlines, and Island Air from Honolulu to Kona district where Mauna Kea is. From Kona City there are authorized tour companies that take tourists to the Mauna Kea summit. Tourists visiting Mauna Kea get a once in a lifetime experience to witness the world’s largest astronomical observatory.There are 13 telescopes placed there, operated by astronomers from eleven countries. Tourists who make it to the summit get a vintage view above the clouds of the spectacular Hawaiian sunset and can stargaze. Due to the clear air, and mininal light pollution, the stars in the sky glitter more brighter. Other recreational activities available are diving, and snorkeling at Manua Kea beach, birding, going on helicopter tours or getting views of the picturesque landscape. Despite the Mauna Kea having a non convetional harsh climate, it’s a vibrant ecosystem. The landscape is dotted with stone deserts, alpine woodlands, shrub lands and tropical forests. A rare and endemic plant the Manua Kea silversword, is found here. This habitat is also home to the red legged partridge (chukar), domestic cow, the rare palila bird, Erckel’s Francolin partridge, ladybird, nene goose, wekiu bug, agrotis moth, and wolf spider according to the UH research. The upper summit has leafy lichens and moss growing there, according to US, Fish and Wildlife Service. Seasoned tour operators report possible health risks when visiting Mauna Kea. Due to there be 40 percent less oxygen, and less air pressure than sea level, health issues among people with heart and lung disease can crop up. The environment is also not good for pregnant mothers, and obese persons whose body mass index is over 40. According to the UH, cinder cones around the Mauna Kea are fragile environments, and tourists are advised to walk only on designated trails to avoid disturbing that ecosystem. Littering is also prohibited.